Contrast in style makes the music world go ‘round. For every Barry Manilow there is an offsetting Metallica out there. And while my last featured artist, Mariah Carey, is about as quintessential pop as it gets, this week’s highlighted band, well…isn’t. Serj Tankian and Daron Malakian both attended the Rose and Alex Pilibos Armenian School as kids in Los Angeles, California. While they were eight years apart, they would end up meeting in 1992, each working on separate music projects. They were in the same recording studio and decided they both had a sound that could work well together. They formed a band named Soil and toiled around in music obscurity for a couple years, before deciding to try something new. A lineup change demanded a name change and, inspired by a poem Malakian wrote a called “Victims of a Down,” their name would become System of a Down. The small change from the poem title was based on the potential appeal to a wider audience and the band’s desire to be shelved closer to their biggest musical influence, Slayer. The next few years were a total grind—demo tape after demo tape, live show after live show. Finally they caught the eye of famed producer Rick Rubin at the Viper Room in Hollywood. He signed them to Columbia Records and the rest is history. 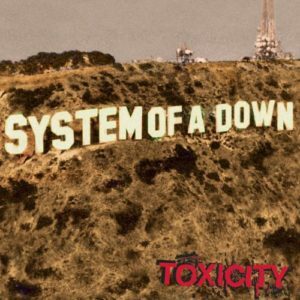 Today I’m listening to their sophomore album Toxicity released in September of 2001. While their first album was a critical success and certified platinum, the band wanted more. Serj (the lead singer) wanted to introduce more vocals, but the band didn’t want to lose their heavy rock sound. Record stores had a hard time categorizing the record, marking it alt rock, metal, hard rock, nu metal, progressive rock—the list goes on. That struggle didn’t halt sales however. The album peaked at number one on the Billboard 200 and selling a quarter million the first week. To date, it has sold nearly 15 million copies worldwide and is certified triple platinum in the states. Various publications have this as a ‘must own’ album, a top album of the 2000’s, and Revolver even has it the eighth best metal album of all time. My introduction to System of a Down came in the late ‘90s with their first release, and I was caught off guard by their total unique sound. Now, it can be a bit of that over-the-top heavy metal sound with the matching hard vocal—so if that’s not your bag, this probably isn’t for you. But if you can roll with that type of rock; this is unlike any hard rock you’ve heard before. It’s metal with a harmony and Serj’s vocals are absolutely unmistakable. If I had to compare them with anyone perhaps a bit more mainstream, the comparison to Korn is probably close, but I would give the nod to System in terms of more pure rock, less of the hip-hop influence. They helped put this style of music in the forefront, getting nominated for Grammy Awards and being featured on MTV, back when they still showed music videos on that channel. After a four year hiatus, System is back touring and working on a sixth studio album. Each of their five albums to date has gone minimum platinum in the U.S., a feat not easily accomplished, especially for a niche genre to most casual music fans. If you ever find yourself wanting to get introduced to the modern metal genre, this is as good a band as any to start with. And this album for $5 dollars greases the wheels.